Downtime costs money! That’s why service and repair of equipment has been and continues to be an integral part of the Illinois Crane mission. Whatever the emergency, expert help can be dispatched to your facility with a simple phone call. Illinois Crane service technicians are on-call 24-Hours a day, 7 Days a week to assure that disabled equipment is repaired quickly and put back in service as soon as possible… all with a minimum of inconvenience to the customer! Illinois Crane also offers pick-up and delivery of your broken hoists or brakes for repair in either our Chicago or Peoria facility. Not all equipment problems are avoidable, but perhaps a scheduled service and maintenance program with Illinois Crane could help avert unplanned work stoppages due to equipment breakdown. 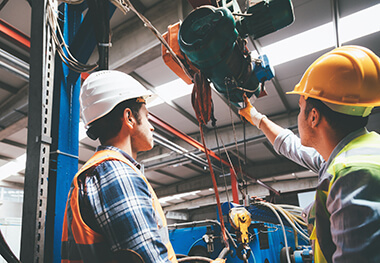 Planned maintenance and inspection programs can help detect potential problems, institute preventive measures and schedule necessary repairs, thereby keeping your production lines running smoothly. Also, the “Hoist In A Hurry” program has provided a welcome temporary solution to many customers faced with unexpected hoist failure. Over 50 OEM Certified & Trained Technicians in the Midwest with over 25 years of experience in repair and testing!